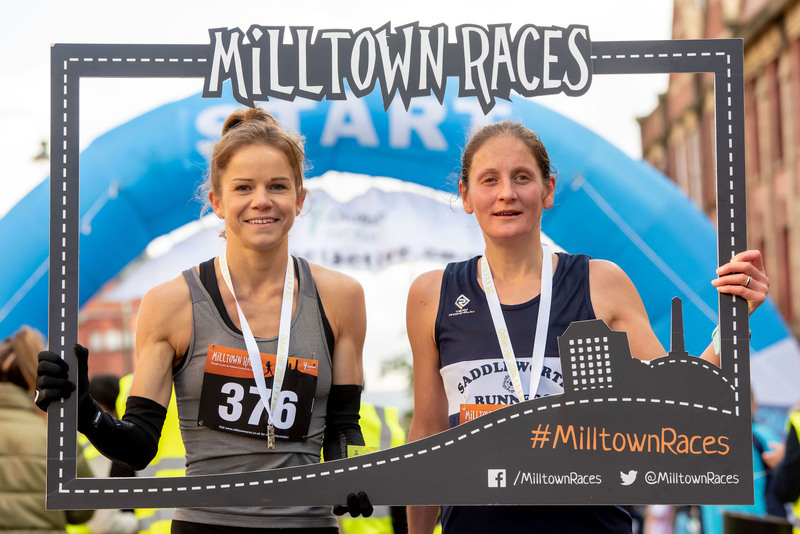 This weekend’s Milltown Races Oldham Half Marathon took the town by storm, with 278 runners pounding the streets from Oldham to Saddleworth. Gareth Raven from Sale Harriers Manchester and Eleanor Davies from Preston Harriers were crowned male and female winners of the 13.1 mile race, which is renowned for being one of the most challenging half marathons in the UK. Gareth finished in 1:15:02 while Eleanor recorded a time of 1:22:28. Second place went to Jan Pichl (1:15:43) from Salford Harriers and third places went to Michael Mannings (1:17:42) from Oldham & Royton Harriers and AC. The second fastest female entrant was Vicky Wright (1:26:27) from Hyde Village Striders and Gaynor Keane (1:36:38) from Saddleworth Runners came in third. The event, which took place on Sunday 28th October, was organised by Oldham Community Leisure (OCL). In total there were 277 finishers who made it round the difficult course – just one runner, the previous winner from the last two years, didn’t make it round the course due to injury. “The Oldham Half Marathon has become a firm fixture in the race calendar, in part thanks to its challenging course, which features more than 1100ft of ascent, and also thanks to the amazing atmosphere local spectators provide. This year’s event was an unmissable experience. The positive feedback since the event has been overwhelming, and I’d like to thank all the local businesses who offered their support, the volunteer marshals and local people for turning out to cheer on the runners. Oldham Community Leisure (OCL) is a community benefit society responsible for the management, operation and development of leisure centres, swimming pools and synthetic pitches in Oldham. OCL’s vision is to create an environment in which sport, active recreation and leisure are integrated into the lifestyle of all Oldham citizens, in order that community cohesion and health benefits are continually improving.